Julia Buffinton serves as Director of Strategic Initiatives for McAllister & Quinn. In this position, she facilitates cross-practice coordination that allows the firm to better serve clients in the Higher Education, Healthcare, and Research Universities & Institutions practice areas. She focuses on providing structure, supporting knowledge management, and improving processes to increase efficiency in internal activities and external services. 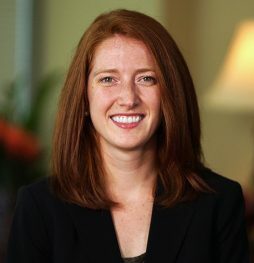 Julia also maintains the firm’s network of over 250 grant consultants; she oversees recruitment, engagement, and professional development efforts. She is responsible for coordinating proposal development teams to support submission of competitive grant proposals. Julia primarily supports projects in the Higher Education, Healthcare, Nonprofit, and Research Universities & Institutions practices. Prior to joining McAllister & Quinn, Julia conducted psycholinguistics research at the University of Maryland. She managed the Cognitive Neuroscience of Language Lab, where she researched the underlying processes of human sentence processing. Julia also coordinated external and internal communication and fundraising activities for the Maryland Language Science Center. Julia is currently pursuing a master’s degree in information and data science at the University of California, Berkeley. She holds a B.A. in linguistics with minors in cognitive science and computer science from Cornell University.